Our aim in this investigation is threefold. Firstly, to see what the earliest writers had to say about Aether. Secondly to examine the various scientific theories and speculations about it in the light of Occult Science, and thirdly to learn what this mysterious substance actually is and consider some of its properties. In our usual afterword, we shall tell you what the great physicist Albert Einstein thought about Aether and to what extent his ideas confirm the facts of Occult Science. But before we begin, it is important to point out that Aether prefixed with an 'a' is not the same as the flammable liquid called 'ether' formerly used as an anaesthetic which has the chemical formula C4H10O. By Aether, Occult Science means an extremely rarefied material element which pervades the entire Universe, which is the source of light, heat and motion. The belief in Aether is a very ancient one. To the ancient Greeks, Aether was the rarefied atmosphere breathed by the gods on Mount Olympus. There is much more in this belief than a poetic metaphor, for, as we may read in The Quest of Ruru. "The lowest rung of the Seven Spiritual Spheres is the Earth...There are six Spheres of Darkness and Sin below the Earth, as well as Six Spheres of Light and Goodness above it. The Earth, therefore, occupies a central position, partaking of the spheres above and below to a certain extent." The higher the sphere or plane, the more rarefied is the Aether which pervades it. By 'Olympus' the Greeks were referring in a concealed manner to these higher spheres, which are the home of the 'gods'—that is men and women who, having learned all the lessons of material existence on Earth, need no longer return to this abode of sin and treachery, but now dwell in the rarefied, pellucid atmosphere of that realm described so beautifully and truly in The Golden Star. "Sacred and inviolable in its Purity it lies between the lower Astral Worlds and the Heavenly Realms. A Holy Barrier that none but Holy Souls of Purity and Wisdom ever pass. It is cut off from earth and all the spheres below it and above, by walls of leaping flames that sear the Minds of those not qualified to enter and blind their sight, so that, perforce, they must return to those abodes for which they are equipped by the nature of their attributes of spiritual modulation." The same book further tells us that: "These are the new arrivals who have just crossed the flames, after spending thousands of incarnations upon earth, learning their lessons of material experience." Although Aether is a homogenous element in itself, it becomes heterogeneous during manifestation, differing in its density in a similar way to terrestrial air, becoming increasingly rarefied the higher we ascend in the atmosphere, and this is what the old Greek writers were hinting at in their ideas about Mount Olympus. As we pointed out in the afterword to our article on the Occult Sun, Space is not a vacuum, but is filled with a subtle fluid, which Occult Science calls, as the ancients did, Aether. This fluid, which cannot be detected by any of our physical senses and is presently incapable of investigation by any known scientific instruments, is unchangeable in composition, indestructible, invisible, and pervades all material things and beings. The grains of sand on a beach, trees, flowers, animals and every cell in our bodies is charged with Aether in varying degrees; sand less than a plant, an animal less than a man. Our entire planet is similarly filled with Aether, is built up from it and moves through a sea of it within our Solar System. We shall explore all this further as we develop our theme. But ere we do so, we must fulfil our promise to discover what the earliest writers had to say about this mysterious substance. The Buddha taught that there is a primitive Substance which is eternal and unchangeable whose vehicle is the pure, luminous Aether. This is "not a void resulting from the absence of forms, but on the contrary, the foundation of all forms", as Madame Blavatsky tells us in The Secret Doctrine. In the fourth century B.C., the Greek philosopher Aristotle employed the word Aether to describe the celestial element—the stuff of the heavens, which as we saw earlier, is just what it is. He went on to say: "we call the substance of the heaven and stars 'aether,' not as some do, because it burns (aithesthai), but because it is always moving (aei thein), being carried in a circular motion, being an element different than the four, unmixed and divine." In this, Aristotle was repeating what he had learnt from his master, Plato, who in his Timaeus, says: "In the next place, we must observe that there are many kinds of fire: for example, there is flame; and the kind issuing from flame, which does not burn but supplies light to the eyes; and the kind which, when the flame is quenched, is left behind among the embers. So likewise of air, there is the most translucent kind which is called by the name of aether." This is not wrong, for Fire, as we may read in The Secret Doctrine "is the most perfect and unadulterated reflection, in Heaven as on Earth, of the One Flame. It is Life and Death, the origin and the end of every material and spiritual thing. It is 'Divine Substance." Four hundred years before Aristotle, the poet Hesiod (flourished ca. 700 B.C.) mentions Aether as a figure of the Highest or Superior Heaven, above which dwells its 'mother' Nix (Night) and its 'father' Erebus (Darkness). Thus, according to Hesiod Aether issued from the dark night of the cosmos and preceded the other four Occult elements of Fire, Air, Water and Earth. This is not so very wrong from the occult point of view if we substitute Light for the father principle which first sets the 'mother'—primordial night or chaos—alight, and so gives rise to Aether, the fifth element, from which arise the other four. The concept of Aether continued to occupy a prominent position in the understanding of natural phenomena until the turn of the 20th century. The French philosopher, Rene Descartes and English scientist, Sir Isaac Newton, as well as many others, sought answers to the phenomena of gravity in the operation of Aether. As long ago as 1644, Descartes posited that Aether was an all-pervading energy with particle like properties very much like air, and as matter moved through it the Aether was displaced. These were dangerous propositions in those times. On the one hand the emerging sciences were engaged in a battle with the entrenched dogmas of the Christian Church and on the other, trying to free themselves from what they considered to be the metaphysical superstitions of occultists and alchemists. Consequently, the concept of 'invisible forces working at a distance' postulated by Newton that could not be proven experimentally was seen as an unwelcome introduction of 'occult' ideas into 'exact' science and condemned by the Church as 'heretical', and regarded by many scientists as untenable. In 1718 Newton speculated on the existence of Aether in his Third Book of Opticks, in which he says: "Doth not this aethereal medium in passing out of water, glass, crystal, and other compact and dense bodies in empty spaces, grow denser and denser by degrees, and by that means refract the rays of light not in a point, but by bending them gradually in curved lines? ...Is not this medium much rarer within the dense bodies of the Sun, stars, planets and comets, than in the empty celestial space between them? And in passing from them to great distances, doth it not grow denser and denser perpetually, and thereby cause the gravity of those great bodies towards one another, and of their parts towards the bodies; every body endeavouring to go from the denser parts of the medium towards the rarer?" When Newton was prompted to explain the nature of gravity in non-mathematical terms, his answer was that gravity might be transmitted by an invisible Aether. He further suggested that Aether may also may be responsible for electricity, magnetism, light and heat, which is just what we said in our introduction. In this, he was reprising what Occult Science had known and taught for thousands of years. Now, we're sure none of our readers would deny that a Force, whether we call it 'gravity', 'electricity', or anything else, which exists outside bodies and in interstellar Space must be something, and not a pure nothing. The German philosopher Leibniz (1646-1716) endowed the whole of creation with mental life, this being, according to him, capable of infinite gradations, a concept we find stated thousands of years earlier in The Divine Pymander of Hermes Trismegistus. In it, the Logos appears to Hermes in the shape of a fiery dragon of "Light, Fire and Flame" called "Pymander", meaning the "Thought Divine" personified, who says: "The Light is I, I am Nous (the Mind), I am thy God, and I am far older than the human principle which escapes from the shadow (Darkness, or the concealed Deity). I am the germ of thought, the resplendent Word, the Son of God." All this is replete with hidden meaning. Science, having spent the last few hundred years probing and prodding matter to give up its secrets, is poised over an abyss filled with ever more elusive sub-atomic particles, none of which provide satisfactory answers to what the Universe is actually made of. It is for this reason that some thinking scientists felt compelled to reluctantly revive the ancient concept of Aether as the only tenable explanation for all the forces and phenomena in Nature. Their reluctance is shared by their modern successors who remain unwilling to embrace what is generally regarded as an outmoded concept based in part upon the results of the Michelson-Morley experiment of the late 19th century. As many of our readers will not know about this experiment, and even fewer are physicists, a few words of explanation will not be out of place at this point in our investigation. In physics, the concept of the Aether or 'Ether' as it was called in the 18th and 19th centuries, had its origin in the necessity for explaining the propagation of light and the existence of electric, magnetic and gravitational fields of force. When it became evident that light is a wave phenomenon, the search for a medium became imperative. While Sound does not traverse a vacuum, light does so perfectly; and electric, magnetic and gravitational attractions are not interrupted by removing the intervening air. Yet all attempts to capture and examine portions of the supposed residual substance and to ascertain its properties by direct observation totally failed. If the Ether is actually a wave-propagating medium (said Science), the speed of the waves is such as to imply an extraordinarily great rigidity with a vanishingly small density. One mode of attack was to seek for evidence of an 'Ether Drift', that is, a relative motion of matter with respect to the Ether through which it moves; just as someone travelling through air experiences wind. The results of such quests proved to be ambiguous. The Michelson-Morley experiment (1887) was the first serious attempt to detect the 'Aether wind' relative to the motion of matter through the stationary luminiferous Aether. It produced a completely negative result. So did the Trouton-Noble experiment (1901-1903), which was an attempt to detect the electromagnetic effect of the motion of the electric charges in a condenser, as carried by the earth in its orbit. In 1871, the English mathematician George Airy (1802-1892) attempted to demonstrate 'Ether drag' by means of a water-filled telescope. His experiment on the aberration of light might be interpreted as indicating that when a transparent substance moves, the Ether is dragged along, not with the full speed of the moving matter, but with a fraction of that speed expressed by Fresnel's so-called 'coefficient of drag'. The validity of this was attested by the experiments of Fizeau (1819-1896) on the propagation of light in rapidly moving water. Over the last several years, there has been a resurgence in interest in performing precise Michelson-Morley type experiments using lasers, masers, cryogenic optical resonators, etc., but as far as we know, all have proved inconclusive. The difficulties presented by such conflicting 'Scientific evidence' were avoided by Einstein, who in his theory of Relativity dispensed with all assumptions as to the supposed stationary Aether or motion with respect to it. It all boils down to the fact that Science does not know what Aether is, and one of its previous exponents ingeniously stated that "it is a sort of mathematical substance which we are compelled to assume in order to account for the phenomena of light and heat." It is rather amusing that such ingenious explanations are derided by scientists in regard to the Aether, but accepted wholesale in regard to the equally 'mathematical' but unproven speculations of String Theory we discussed in our article on Why matter matters. Is this a case of swallowing camels whilst straining at gnats? We wouldn't like to say! Notwithstanding that most modern scientific dictionaries dogmatically assert "that the theory that electromagnetic waves need such a medium (Aether) for propagation are no longer tenable," has not prevented some brave—or perhaps foolhardy—scientists from revisiting the ancient concept and searching for this elusive medium. Foremost among these researchers was the American inventor of the so-called 'ether engine' or 'Keely motor', John Worrell Keely (1837-1898). Unfortunately, his work was so far beyond the pale of orthodoxy that scientific acceptance eluded him. Nonetheless, his theories are most interesting from an occult point of view and if you wish to learn about his work and experiments you will find several pages devoted to him in volume 1 of The Secret Doctrine (page 554 et seq). Dayton Miller (1866-1941) was another scientist in search of the elusive Aether. He originally worked with Morley to refine the Michelson-Morley experiment and had some success in showing that the Earth is moving through some type of invisible medium. Unsurprisingly, Miller's work is hardly known or cited by modern physicists. Nor do they mention many of the other experiments that were conducted during the 19th and early 20th centuries. Instead, they focus almost exclusively on the Michelson-Morley experiment as proof of the non-existence of Aether. Other notable researchers in this field were Hendrik Lorentz (1853-1928) and Henri Poincaré (1854-1912). Lorentz introduced a strict separation between matter and Aether which, in his model is motionless in itself, but capable of setting ponderable matter in motion when it enters into it. This is not so very wrong as we shall see in the final part of this investigation. For more than fifty years no real advance was made on the work of Miller, Lorentz and others. It seemed as if the Aether theory had completely died out. But as we saw earlier, the need to explain the various electric, magnetic and gravitational forces made it imperative to find that elusive 'something' which would solve the serious flaws in the so-called 'standard model' of physics. It was this that led to the revival of the concept of the Aether. In 2006, Glenn Starkman, a cosmologist at Case Western Reserve University in Cleveland, Ohio, in the USA, argued that Aether can account for all the unexplained problems that have led scientists to formulate their theories of 'dark matter'. One of these problems is that galaxies appear to contain more mass than is visible to astronomers. During the 1990's two other scientists, Paul Stowe and Barry C. Mingst, wrote several papers both together and separately about the Aether. Stowe summarised his ideas in his paper Simple Beauty, subtitled 'A Foundation for the Unification of Physics' published in 1996. In it, all the basic cosmological constants are defined and related to a hydrodynamic super fluid. If we substitute the word 'Aether' for Stowe's 'super fluid' his thesis confirms the facts of Occult Science we shall consider in the next section. In 2005, David G. Yurth and Donald Ayres from the Nova Institute of Technology, Holladay, Utah, USA, showed how the current 'standard model' of physics fails to give a comprehensive view of nature because it is based on a number of flawed and incomplete assumptions. According to these scientists, the most glaring defect in this model is its inability to demonstrate an underlying order in the Universe. They went on to provide a "scalar roadmap which describes how matter, energy, time and all other field effects arise from the Physical Vacuum". This sounds suspiciously like the Aether to us, but we do not blame these two eminent gentlemen from shying away from using this contentious word! Their reticence is shared by two American physicists, David L. Bergman and Charles W. Lucas, who have developed a classical structure of physical reality based primarily on their view of the electric field or plasma filaments. While they deny the existence of Aether, their discussion of matter as composed of plasma filaments is similar to the fundamental 'fluid' which dare not speak its name. While all the various modern theories about the Aether are a step in the right direction, none of them tell us what it actually is, so that will be our final task in this investigation. To understand what the Aether is we need to go back to Aristotle who, despite his differences of opinion with the ideas of his Master, Plato, was undoubtedly a great Adept in the material sciences. Aristotle stated that there are three principles of natural bodies; privation, matter and form. By 'privation' Aristotle did not mean lack or absence, but the 'idea' of a plant, animal or human being to be, which he located in the invisible Mind of the Great Architect of the Universe. We might call it the thought-form or prototype of a thing, from which matter passes from the shape it has not to that which it assumes. Although the privation, prototype or thought-form of an ant, a tree, a human being, an unmade building, picture, stature or even this article, has neither substance nor any quality as yet, nor any kind of material existence on earth, it is still something, for thoughts are not the insubstantial things most people imagine, as Bulwer-Lytton tells us in his occult novel Zanoni when he says "Every thought is a soul!" The subtle medium by, or through which, this thought-form or prototype, is transmitted is the universal Aether. We may liken this subtle, invisible fluid to electricity, but not any kind of electricity known or detectable by our physical senses or any scientific instruments currently available to science. Some of the properties of the Aether were described by the scientist Samuel Lytler Metcalfe (1798-1856), whose work we discussed in our article on the Occult Sun. But what he called 'Sun Force' is only one of the principles of Aether, its physical residue, so to say, on our plane. Aether serves other cosmic and terrestrial purposes besides being the agent for transmitting light, heat and motion. If this is difficult to grasp—and we acknowledge that it is—the reason is that Aether is the purest form of matter whose true nature cannot be comprehended by the unaided human intellect. The only way we know how to regard the problem is to think of Aether as the highest of seven degrees of step-down transformers from the Kosmic Generating Station, and what that is, remains the secret of the Supreme Architect of the Universe which we do not presume to know! What we can say is that as soon as this privation of matter, this thought-form, is transmitted by energy to the universal Aether, it becomes a material form, however sublimated. Quite how the whole process works we do not pretend to know, and quite frankly we doubt if any occultist, however knowledgeable, could explain it in ways which would not be misunderstood. Yet, as even modern Science teaches us that human thought 'affects the matter of another universe simultaneously with this', those of us who believe in an intelligent First Cause cannot deny that the Divine Thought is equally transmitted by the same Law of Energy to the Universal Aether; or that which has been called, and is, the World Soul by many occultists. From this it follows that this thought-form manifests itself objectively, energy faithfully reproducing the outlines of the 'privation' which was first born in the Divine Mind as Aristotle tells us. But we must not fall into the trap of thinking that it created matter, rather it creates the design for the future form—that which Aristotle called privation. 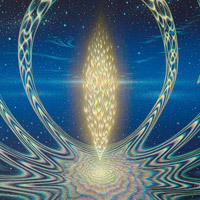 The matter which enters into the construction of this design has always been in existence, for Occult Science teaches that matter is eternal, the same as Spirit, though the former undergoes periods of 'sleep' and 'waking' to which every Kosmos is subject, as we discussed in our article on Occult evolutionary cycles. Space, whether interstellar, inter-atomic, or even the gap between the ears of a complete idiot, is not a vacuum, but it is filled with a subtle fluid or gas which Occult Science calls the Aether. It is unchangeable only during each Manvantara, or period of manifestation of a Kosmos, which we discussed in the aforementioned article, after which it merges once more into the 'Root of Nature', or the eternal primordial substance from which all manifestation arises. Yet, conscious and grand Beings, clothed in that same essence, move in it. A 'world' is built up in this ethereal fluid and moves through an ocean of it. Without it there could be no motion; without it particles of ponderable matter could not glide over each other; without it the infinitely small—the atom, as well as the infinitely large—the Solar System—would collapse. Without Aether there could be no impulse to excite those particles into action. Aether connects Sun with Planet, Planet with Planet, Man with Planet, man with man. Without it there could be no communication in the Universe; no light, no heat, no phenomena of motion. The four Occult Elements of Fire, Air, Water and Earth, emanate from, and have their origin in, the fifth element—Aether, and it is from these elements that all material forms are moulded. As we have seen, Aether has a twofold existence; homogeneity and heterogeneity. As long as it is homogeneous (primordial) there is no manifestation, no phenomenon; all is hushed in sleep within the mystery of the unmanifest, which is non-being to us, but complete being to those spiritual entities who dwell within it. Aether becomes heterogeneous only when the Universe awakens from its sleep. The Aether of Space corresponds mystically to the manifested Intellect or Soul of the World as it is called by occultists. In man it is called Manas, or the Higher Mind in our terminology; as such it forms part of the True Soul too—of which the Higher Mind is the negative aspect, while the Soul is positive, as we discuss in our occult studies course article on the Soul. Such, then, is a very brief outline of the nature of Aether according to the Teachings of Occult Science. We hope to say more about the four Elements of Fire, Air, Water and Earth in a future article. © Copyright occult-mysteries.org. Article published 30 September 2018. In our afterword we briefly consider Albert Einstein's ideas about Aether. 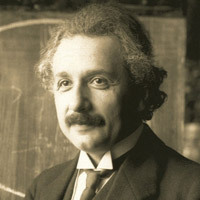 Albert Einstein presented his ideas about Aether in an address given at the University of Leiden in The Netherlands in 1920. His topic was "Ether and the Theory of Relativity." His lecture was translated from German into English and published by Methuen & Co. Ltd, London, in 1922, from which we have selected those passages which have a bearing on our theme. The interpolated comments in [square brackets] and concluding remarks are ours. Outside of physics we know nothing of action at a distance. When we try to connect cause and effect in the experiences which natural objects afford us, it seems at first as if there were no other mutual actions than those of immediate contact, e.g. the communication of motion by impact, push and pull, heating or inducing combustion by means of a flame, etc. It was Newton's theory of gravitation that first assigned a cause for gravity by interpreting it as action at a distance, proceeding from masses. Newton's theory is probably the greatest stride ever made in the effort towards the causal nexus of natural phenomena. And yet this theory evoked a lively sense of discomfort among Newton's contemporaries, because it seemed to be in conflict with the principle springing from the rest of experience, that there can be reciprocal action only through contact, and not through immediate action at a distance. When in the first half of the nineteenth century the far-reaching similarity was revealed which subsists between the properties of light and those of elastic waves in ponderable bodies, the Ether hypothesis found fresh support. It appeared beyond question that light must be interpreted as a vibratory process in an elastic, inert medium filling up universal space. It also seemed to be a necessary consequence of the fact that light is capable of polarisation that this medium, the Ether, must be of the nature of a solid body, because transverse waves are not possible in a fluid, but only in a solid. The development of the theory of electricity along the path opened up by Maxwell and Lorentz gave the development of our ideas concerning the Ether quite a peculiar and unexpected turn. For Maxwell himself the Ether indeed still had properties which were purely mechanical, although of a much more complicated kind than the mechanical properties of tangible solid bodies. [This is just what we said above]. The laws were clear and simple, the mechanical interpretations clumsy and contradictory. [We should say so!] Almost imperceptibly the theoretical physicists adapted themselves to a situation which, from the standpoint of their mechanical programme, was very depressing. Thus the purely mechanical view of nature was gradually abandoned. [By those who posited the concept of the Aether, but not by mainstream science, which still clings doggedly to its mechanistic outlook]. But on the other hand there is a weighty argument to be adduced in favour of the Ether hypothesis. To deny the Ether is ultimately to assume that empty space has no physical qualities whatever. The fundamental facts of mechanics do not harmonize with this view. For the mechanical behaviour of a corporeal system hovering freely in empty space depends not only on relative positions (distances) and relative velocities, but also on its state of rotation, which physically may be taken as a characteristic not appertaining to the system in itself. Well, well, well. Who would have thought that Einstein was prepared to consider the existence of Aether as it is understood by Occult scientists! Such, at least, is our understanding of the final words of his address. Note that he tells us: "The idea of motion may not be applied to it (Aether)." In other words it is motionless in itself, but is the cause of motion in all ponderable matter, as we discussed in the final part of our article. In connection with space and time, Einstein's words are not so very different from those of H. P. Blavatsky who, in The Secret Doctrine, tells us: "Time is but the movement of consciousness through and in Space." Some 20 years after Einstein delivered his address, he declared that the Universe was an orderly space under the directing hand of God. That such a famous scientist should declare that the Universe is regulated by the hand of God in an orderly manner came as a tremendous shock to the materialists of science. Einstein went on to say: "I cannot believe that God plays dice with the cosmos." Of course not, and He, in all His Divinity and Wisdom could not do so if He wished it, for Occult Science tells us that the Universal Laws bind everything and every one, great and small, and there is no escape from them anyway, nor evasion, though man, in his prideful arrogance may imagine so! The Occult Sun: a comparison of the theories of material science with some of the little-known facts of occult science about the Sun. The Golden Star by J Michaud PhD: Vision 8—The Kosmos.